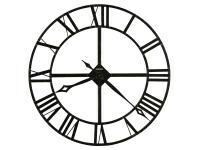 There will be plenty to like with this wall clock in your home decor. The piece carries a Windsor cherry finish on select hardwoods as well as solids and features dials that are encircled by polished and lacquered brass bezels and convex acrylic crystals. Plus, a thermometer, clock, barometer and hydrometer are encased in a hardwood frame while a decorative frosted disk accents the middle to provide balance. Add a functional addition to your home that's still rich in timeless style with this beautiful wall clock. The 612 Olympia Wall Clock by Howard Miller at Becker Furniture World in the Twin Cities, Minneapolis, St. Paul, Minnesota area. Product availability may vary. Contact us for the most current availability on this product. Wood & Finish Windsor cherry finish on select hardwoods and solids.